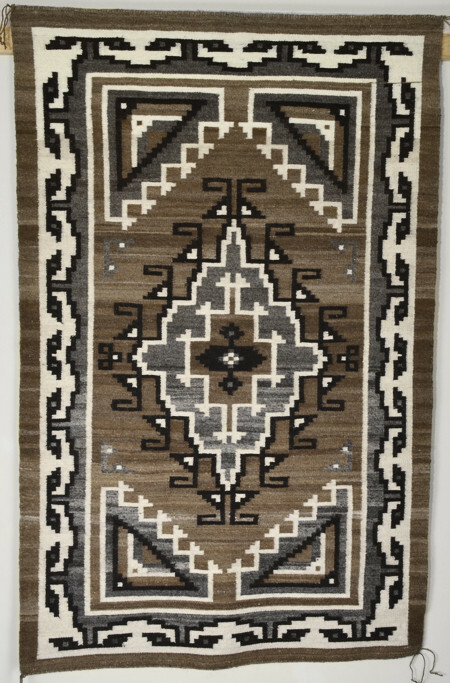 Two Grey Hills Rug with Churro Wool by Lena Williams (Navajo) Two Grey Hills rugs are typically woven with natural colored wool in white, black and shades of brown and/or grey. These rugs are usually much finer in yarn and weaving and take much more time to make. 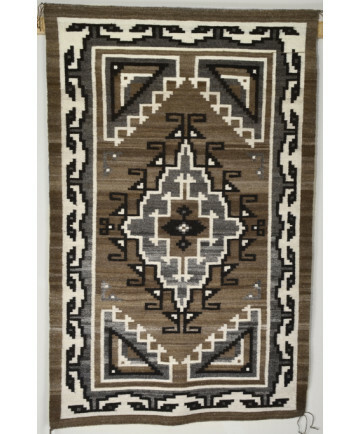 These rugs often have a border and the patterns tend to be more complicated than similar rugs such as Ganado or Klagetoh. The name of the design does not represent hills. The design is named for a village in New Mexico. This rug is hand cleaned, carded and spun. Addtional pictures show the different color types of churro wool used in the making of this rug. This rug measures 38 inches by 60 inches.